Home » News » Just in Time for Christmas! Package deal on The Summer Garden and the Song: The Circle of Life and The Summer Garden and the Song: Harvest! Just in time to buy for the book lovers in your life, N.W. 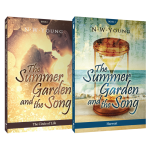 Young is offering his epic 2-part love story, The Summer Garden and the Song, for the package price of $35 when you buy both books! The Summer Garden and the Song: The Circle of Life begins the story of Mick Neilson, a small town teenager in the 1950’s. The Summer Garden and the Song: Harvest, continues his story. Set in Norfolk County – the tobacco belt of Southwestern Ontario – readers will enjoy the countless cameos of tobacco harvest and events, music, people and places from the era. Each book is individually priced at $19.95 and is available on Amazon and the CODP online store, but the set price of $35 is ONLY available through CODP and the author! Get your copies HERE today!